Quit claim deeds are legal documents used to transfer property. A quit claim deed pdf is prepared by a grantor and signed over to a grantee. The grantor is the person transferring the property and the grantee is the person receiving the property. Once signed and executed the grantor quits his or her ownership of the property allowing the grantee to assume ownership and the transfer of the property, hence the name “quitclaim” – the grantor is quitting his claim of ownership of the property. Unlike warranty deeds, a quit claim deed form does not provide the grantee a warranty on the title. You need a quit claim deed when you want to transfer property fast. You need a warranty deed when you buy property to make sure that the title is clear. A quit claim deed is most often used to transfer property between family members or assign property into a trust. Quit claim deeds also come in handy during divorce proceedings and are very useful if you need to transfer property quickly. Download our quit claim deed pdf form with everything you need to fill out a quit claim deed on your own. Preparing a quit claim deed pdf is quick and easy. First, date the deed and fill in the grantor and grantee names and addresses. Next, enter the address and a full description of the property to be transferred. Make sure to include a complete description of the property. 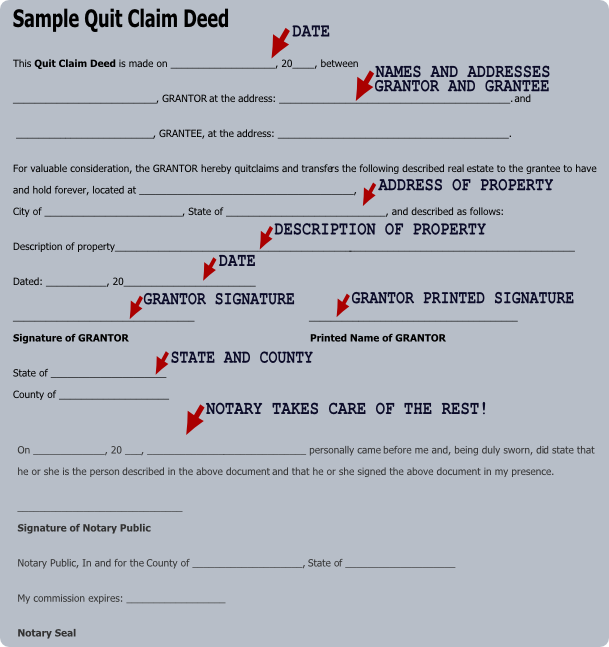 Next, the grantor takes the quit claim deed form to a notary to witness the date and signature on the form. Then the notary will sign, date and seal your quit claim deed. Finally, your quit claim deed pdf form should be filed with your local county clerk’s office to record the deed. Fill out and print a free quit claim deed pdf in just minutes online.